While reading the book Mom, Inc. by Meg Mateo Ilasco and Cat Seto, I came across a term I thought was brilliant: creative “slashie.” The authors talked about how they consider themselves creative slashies, i.e. artist/designer/writer. I thought to myself: Yes! Finally someone has come up with a term to describe me. It turns out I’ve always been a creative slashie. Yes, I’m a graphic designer, but I also pursue many other creative outlets. So, now you can call me a graphic designer/blogger/bookbinder/artist. How’s that for a creative slashie? Some people may make it seem like pursuing varied creative interests makes you scattered or flighty. However, I’ve always felt that by pursuing all of my creative inspirations, I am honoring and showing gratitude for my unique talents. And as Mom, Inc. authors Meg and Cat so eloquently put it, “Once you tap into your inner creative and project your talents to the world, you won’t always know what your next act is going to be—and that’s the beauty of it.” I couldn’t have put it better myself. Read my book review of Mom, Inc. here. What kind of creative slashie are you? Ilise Benun of Marketing Mentor is an author, consultant, speaker, founder of Marketing-Mentor.com and co-producer of CFC: the business conference for the creatively self-employed. Ilise has indeed been a marketing mentor for me. Several years ago, I attended one of her marketing webinars that helped me get more organized with my marketing. I met Ilise at the inaugural Creative Freelancer Conference in Chicago in 2008 and we have kept in touch ever since. Her advice and books have been a valuable resource as I grow my graphic design business. Tell us a little about what you do/who you work with. I specialize in working with self employed creative professionals and I help them get the clients they want at the fees they want to charge. How has your past work experience influenced your current career? I actually had very little work experience before I ventured out on my own, or was pushed actually, when I was fired from my second job out of college. I started helping the creative types who surrounded me in NY and started simply by helping them get organized and get paid. From there it evolved into helping with marketing, pricing, proposals and any other business issue that presents an obstacle to growing a business. What is the favorite part of your workday? I don’t think I have a favorite. Every day is different and I make my own schedule, which is what I like best. I start early and I tend not to work too late. I also take breaks for dog walks or just to clear my head. What do like best about working with creative people? Well, not all creative people are alike. Some are flaky and unreliable and don’t usually get far in business. I like working with creative people who are professional in their approach and open to bringing their creativity to the business side of their business. You have a great idea for a book, tee shirt, invitation, app or other creative project. But how do you make it? Here are some of the vendors I met with at the HOW Design Conference. One of them is bound to match your creative needs. Are you an author, photographer or designer? Blurb Books is for you. Make your own book using their easy-to-use software or create a custom design. (Designers: an InDesign plug-in is coming soon!) Create a softcover or paperback book—or a hardcover book that can rival any store-bought book. For high-end projects, they now offer a “Proline” that includes premium papers and linen endpapers. I’ve made many a Blurb book…and have several in the works! In addition to printing business cards and other paper goodies—like my super-cool square business cards with rounded corners!—they also print apparel, including allover printed full-color tees. Moo has developed a cult following among artists and designers for their ability to print multiple back designs on a business card. Go to a craft show and you’re bound to see some Moo Cards. To add to their coolness factor, they are now offering stickers. Yes, you can print multiple designs—and even create a sticker book. This is the “candy store” for paper-loving kids. I’m a frequent shopper here, as papers can be purchased in small quantities. Perfect for that party or wedding invitation you may be working on. Specialty papers such as perforated papers are also available. You stare at your phone all day, why not have a case that’s nice to look at? Uncommon lets you create your own iPhone case by simply uploading your artwork. Need blank notecards, twine, rubber stamps, or other goodies for your crafty projects? Check out this new shop from Mohawk and Felt & Wire. I adore the rice paper masking tape. Have an idea for a mobile app? Their turnkey system makes it easy to create and maintain your very own app. Custom apps also available. Need to brush up on your art or design skills? Looking to take your creative hobby into a business? Find the books you need here—as well as Moleskine notebooks to jot down your great ideas. Know other great vendors for creative or artsy folks? Share in the comments! Yesterday (June 21st) was the Summer Solstice, which marks the longest day of the year. Besides more “al fresco work days” (via laptop and wireless), I’ve been planning a few ways for my small business to kick off summer in creative style. I like to stay in touch with clients and friends by sending cards with a handwritten note throughout the year. And since my logo is the sun, sending a “summer solstice” card seemed only natural. TIP: sending a card on a less-expected holiday always makes an impact. Leaving the office for a few days to get creatively inspired and network with other professionals is important for small business owners—especially solopreneurs. So this year, I decided to attend the HOW Design Conference, which just happens to take place in my hometown! How did your small business kick off summer? After reading a recent article in HOW Magazine based on the upcoming book The Creative Process Illustrated, I was inspired to think about and illustrate my own creative process. I try to keep my sketches neat, as I sometimes scan and email them to clients before I jump on the computer. But I try not to let that keep me from pushing myself and expressing all my ideas. Sometimes that so-called “reject” turns out be a winner! How do you picture your own creativity? Read a Q&A with Picturing Creativity book authors here. 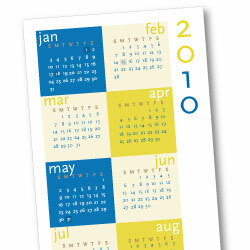 2010 Quick Peek Calendars - buy online! I’m delighted to share that my 2010 Quick Peek Calendar is featured on the Artisan blog as an example of creative self-promotion. After many years of sending holiday cards to clients and friends in December, I decided to start sending a New Year card and Calendar instead. The response has been very positive. I love walking into a client’s office and seeing my calendar posted on the wall. And this year, I even got several requests for calendars in advance of mailing them! With the boom of online promotion, I think people like to get something in the mail (that isn’t a bill, that is). Not to mention the calendar concept fits perfectly with my policy of sending gifts that are beautiful, yet practical. Thank you to my friends at Artisan in Chicago!